Contrary to popular belief, the best thing to come out of New Orleans is not red beans and rice, it is Mahalia Jackson. Jackson is the greatest gospel singer of all time. Seriously. She had the voice range of a contralto. Jackson led a rather happy early life despite a bowing in the legs. Doctors wanted to break both legs and set them, but family members rejected the idea and her mother would rub her legs down with greasy dishwater to try and correct the problem. When her mother died, Jackson and her brother went to live with an aunt. There she was worked from dawn till dusk. If the house wasn't spotless, she was beaten, needless to say, there was no time for school but Jackson found solace in the church. One day, after hearing her sing, another aunt proclaimed that one day Mahalia would sing for royalty. The prediction came true. At sixteen, Mahalia left New Orleans for Chicago. There she found her true calling. She began singing and touring with a pianist. Before long, the venues were so large, she was accompanied by an orchestra. Though she was offered exorbitant amounts of money to switch to secular music, she refused, staying true to the gospel music that changed her life. In 1998, the Grammy Hall of Fame honored Jackson's recording of the song "Move On Up A Little Higher", recorded in 1948, it sold eight million copies. 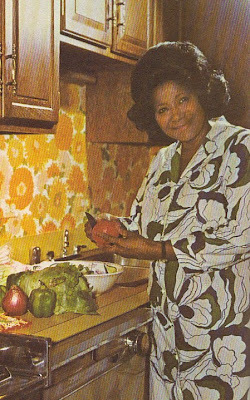 What many people don't know about Mahalia Jackson, is her avocation as a cookbook author. 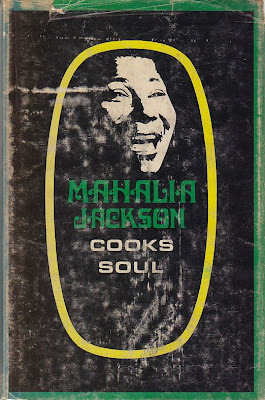 Mahalia Jackson Cook Soul was published in 1970, two years before Jackson's death. The book is filled with great old-fashioned soul food, catfish stew, succotash, beef and biscuit pie and my favorite, gizzards and rice, which she calls a "Soul Bowl". Here is a muffin recipe with a distinctly Southern flair. Sift meal four, salt, and baking powder together. Cream shortening and sugar together and add egg, beating well after each one Stir in milk and sorghum. Add dry mixture, stirring gently. Pour into well-greased muffin tins until each ring is two-thirds full. Bake at 375 F for twenty-five minutes. Makes eighteen. When I lived in Alabama,we never missed the chance to go over to Loachapoka, Alabama for their annual "Sorghum Sopping" when the population of Loachapoka rises from 135 to 15,000. Though it is often called sorghum molasses, sorghum is actually harvested from the cane as a juice and then boiled into a syrup. Molasses is a by-product of making sugar. Whip up some of these muffins and blast Mahalia Jackson from your speakers and you just might find yourself in the presence of God. Had to switch out the broken link. Playing now!